The 20th ECWS exhibition and symposium in Salamanca, September 2017! 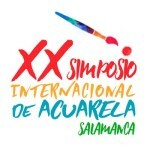 the 20th symposium of the ECWS will be held in Salamanca (Spain) by AEDA (Agrupación Española de Acuarelistas). More than hundred of watercolours will be on show at PALACIO EPISCOPAL SALAMANCA (inside the cathedral complex) from 27 September to 1 October, 2017. Salamanca is a world Heritage Site being one of the most important from the point of cultural, historical and monumental view. The ECWS symposium has joined enthusiastically all local, church, university and commercial institutions willing to receive hospitality to all participants and enjoy them in the “Watercolour outdoor” for a few days promise to be unforgettable. During the symposium participants will visit the city of Salamanca and the village of La Alberca (declared historical artistic monument) in the heart of the mountains and paint together!